"This is one of the most popular corn dishes during Thanksgiving and Christmas. It is not your traditional boring old corn. This recipe includes butter, cream and shallots. I always get rave reviews when I make this." Melt butter in a large skillet over medium heat. Add shallots and sugar, and saute for 2 to 3 minutes. Stir in corn and water, and cook until tender, about 5 minutes. Gradually stir in cream, and cook until cream is reduced and sauce thickens, about 8 minutes. Season with nutmeg, salt, and pepper. 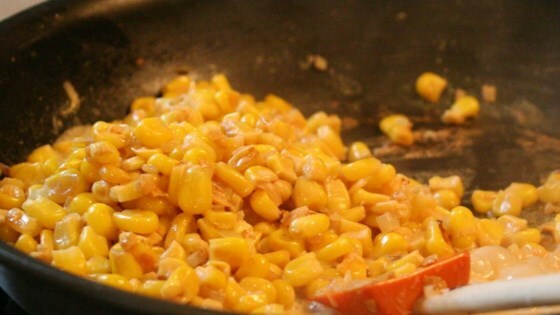 See how to make an easy, rich, and creamy corn side dish. This was just okay, nothing spectacular. Easy to prepare and the cream added a nice taste and texture. Unfortunately we found this to be bland. I'll try this again with extra shallots. So good I will never have plain corn again!! Followed recipe exactly and there was not one kernel left. Thanks for the recipe. I liked the base of this recipe. I added fresh garlic when I sauteed the onions (what I had), skipped the nutmeg, and added garlic salt at the finish. Wonderful! Delish - my family loved this! I added some thinly chopped green and red pepper for color as well. Easy and tastes great. I made it for a birthday dinner and everyone loved it.